The only US 8th Army Air Force fighter group to retain the mighty P-47 Thunderbolt throughout its combat tour in the European Theater of Operations, the 56th Fighter Group justified its nickname of 'Zemke’s Wolfpack' by the aggressive attitude and tactics instilled by its original wartime commander Hub Zemke. This attitude continued through to VE-Day under the auspices of his successors Dave Schilling and Lucian Dade, and it became the top scoring 8th Air Force group for victories in air-air combat. Justifiably considered one of the greatest tacticians and leaders in VIII Fighter Command, Zemke’s leadership engendered an esprit de corps that was second to none. Fighting High Publishing brings together historians Nigel Julian and Peter Randall to tell the story of the ‘Wolfpack’, complimented by a foreword from the Group’s wartime leader’s son Hub Zemke Jr. The two authors are the owners of the websites at 56thfightergroup.co.uk and littlefriends.co.uk respectively, universally acknowledged as the two finest sites on the 56th and VIII Fighter Command. Having researched the 56th Fighter Group for many years, they have established an international reputation for their expertise in the history of this famous unit. 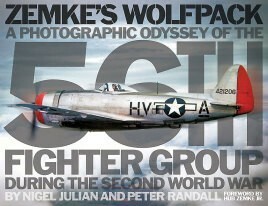 Looking beyond the Thunderbolt flight line, the authors have delved deep into their own extensive collections, along with the 56th Fighter Group museum archives and the many private photograph albums, made available to them by veterans and veteran’s families, in order to produce the most in-depth photographic record of the Wolfpack and its associated service units published to date. More than 400 photographs, the majority of which are previously unpublished, show views from behind the scenes alongside newly discovered aircraft noseart, social events, maintenance and repairs which, together with detailed captions, make this a visual and information feast. The modern day legacy is recorded with a section depicting memorials to the 56th Fighter Group. A full honor roll of those who made the ultimate sacrifice is included along with details of all confirmed claims by the Group’s air-air 'Aces'. Peter Randall is the owner and founder of the website littlefriends.co.uk, one of the earliest sites on the Internet dedicated to the US 8th Army Air Force Fighter Command, and recognized as the most comprehensive on-line database for this specialized subject. Peter, motivated by the lack of detailed information contained in the early published 8th Air Force fighter unit histories, began collecting records of serial numbers, unit and pilot allocations and their respective fates, culminating in the online publication of his unique and exemplary website. Hub Zemke Jr, author of the foreword to this book, is the son of Hubert Zemke who commanded the 56th Fighter Group during the Second World War. 4. The Republic P-47 Thunderbolt – Cave Tonitrum! "This is a goldmine of information, of memories and detail for the modeler. A fine tribute to a group or airmen in WW2 and clearly the work of two authors who have a particular passion for the history of 'Zemke's Wolfpack'." "brings together historians Nigel Julian and Peter Randall to tell the story of the Wolfpack, complimented by a foreword from the Groups wartime leaders son Hub Zemke Jnr. The two authors are the owners of the websites at 56thfightergroup.co.uk and littlefriends.co.uk respectively, universally acknowledged as the two finest sites on the 56th and VIII Fighter Command. Having researched the 56th Fighter Group for many years, they have established an international reputation for their expertise in the history of this famous unit. Looking beyond the Thunderbolt flightline, the authors have delved deep into their own extensive collections, along with the 56th Fighter Group museum archives and the many private photograph albums, made available to them by veterans and veterans families, in order to produce the most in-depth photographic record of the Wolfpack and its associated service units published to date. More than 400 photographs, the majority of which are previously unpublished, show views from behind the scenes alongside newly discovered aircraft noseart, social events, maintenance and repairs which, together with detailed captions, make this a visual and information feast. The modern day legacy is recorded with a section depicting memorials to the 56th Fighter Group. A full honour roll of those who made the ultimate sacrifice is included along with details of all confirmed claims by the Groups air-air 'Aces'." "There is much for modelers and historians alike… and if one hankers for the full story behind the subject one is building, this is the perfect book"